Stepan Volkov forfeited his future when he was paid to forget his past. Forced to adapt, he ultimately became the world's most wanted killer... feared, vicious and brutal. A tool of the Organizatsiya, a Russian crime syndicate that forged him into 'The Wolf', he's pursued by American spies and Australian agents, torn between his need to survive and his desire to be free. When a shock encounter in Australia uncovers forgotten secrets and threatens uneasy allegiances, Volkov suddenly sees a choice... one he thought would never be his to make. With a billion-dollar international oil deal threatening to shift the global balance of power, will Volkov return to Moscow to wage war for the Organizatsiya, or will he find the courage to escape with a vengeful thief whose life he destroyed? 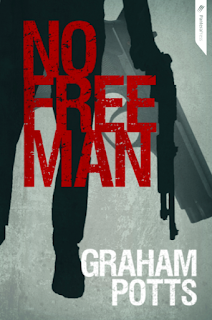 War defines the first decade of Graham Potts’s adult life. Potts has been known to have inspiration strike at inappropriate moments – such as when out on the wing of an aeroplane! That may sound as dangerous as one of his plots, but as an active member of the Royal Australian Air Force, it is merely an occupational hazard. Despite challenging and ongoing RAAF assignments his inner strategist has finally acknowledged the truth: writing is his passion. Graham has a thirst for literature and appetite for intrigue. His action-packed style throws you into international conflicts closer to home than you think. He tells stories that captivate, thrill and touch on the truth. And if you buy him a scotch, he might tell you a tall one or two. Being from a Defence family that was always on the move, Graham has lived in nearly every state of Australia. His early love of reading and writing was sparked in primary school, where he discovered stories were something he could easily take with him. Graham Potts is now taking his story to the world. Thanks to everyone who entered, this giveaway is now closed.